The yearly trash cleanup project headed by TV Azteca arrived at El Naranjo Turtle Camp, where the participants cleaned seven kilometers of virgin beach at Costa Capomo. TV Azteca’s domestic campaign, Limpiemos Nuestro México (Let’s Clean Up Our Mexico), celebrated its sixth year on Sunday, May 25th. The Nayarit Ecologists Group requested to be part of this project and thus participate with the cleanup of Nayarit. This civic association is dedicated exclusively to the operation of the El Naranjo Turtle Camp, which is located on the beach just past the Peñita de Jaltemba and is part of the Costa Capomo development. 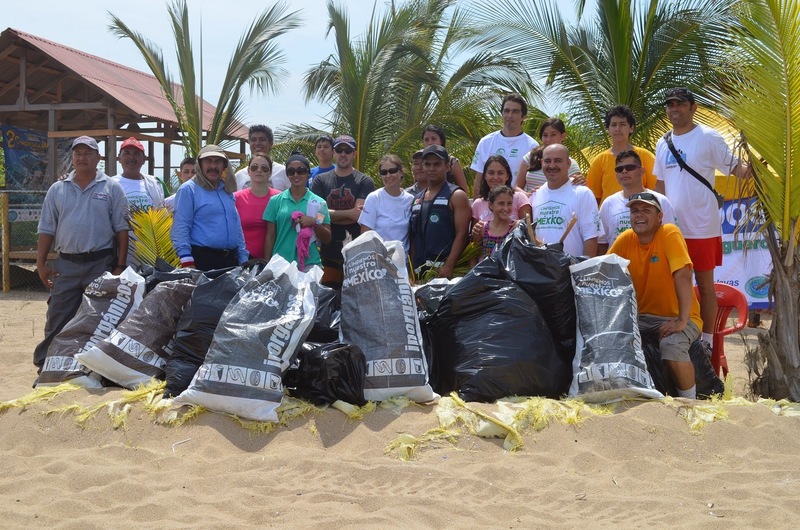 Ricardo Villaseñor, president of the association and the person in charge of the camp, worked together with his team to unite over 50 locals to take part in the cleanup of seven kilometers of virgin beach. “It’s important to begin the beach cleanup in June, because the sea turtles will arrive soon. We also put together three more cleanups besides this one during the course of the year, basically one every two months once the rainy season starts,” he explained. The rainy season brings in the most trash as the rivers flow to the sea, taking with them all the waste, which washes back up onshore. It then creates an obstacle course for the turtles. Francisco, Mendez, regional delegate for the Fondo Nacional de Fomento al Turismo (FONATUR), was present at the event, participating in the cleanup with his family alongside the rest of the locals. Families from Tepic, Compostela, Bahía de Banderas and Puerto Vallarta all came together for this cleanup. Afterwards, they all enjoyed a family day at the camp’s beach facilities. Limpiemos Nuestro México is a domestic campaign inviting citizens each year to participate in the biggest cleanup in the history of the country, raising awareness along the way for people to put trash where it belongs. The Riviera Nayarit was part of this important environmental consciousness movement, which brought together over 85 million volunteers who cleaned up 42 thousand tons of trash on the aforementioned date.